I've been wrapping and wrapping presents and there seems to be no end to them. Y'all know what I mean? Seriously it seems like the presents multiply when I'm not looking. Makes me rethink all this stuff I've bought. I know I'll be rethinking those blocks when I'm stepping on them..... OUCH! If you read my blog regularly you already know I'm OCD and my wrapping paper has to coordinate with my tree decorations. Yes, SERIOUSLY......so wrapping presents isn't always a "fun" project. The paper needs to be just so, the bow needs to be just so. What happened to the me who years ago bought a bag of pre made stick on bows and slapped them on? I want that girl back. It was so much easier that way. Well if your a bow slapper......CONGRATULATIONS! You have the right idea and your wrapping will be less stressful and you will have more time to make amazing cookies. Unlike me who has been sticking with simple cookies because of OCD present wrapping. GOOD NEWS is that I'm almost done wrapping. Everything was wrapped last night. I just need to make the bows......and cute labels. I know these aren't Christmas cookies but they're cute. I was contacted by someone whose daughter was having a fairy themed party. This was what I came up with. Not too bad right? If I wasn't so busy I could have taken a better picture, but y'all know I've got wrapping to do. You'll forgive me right? Ok well I must get back to my tedious wrapping. Unless a wrapping fairy stops by....lol. I hope to be done today and making you amazing cookies by Monday.....deal? Bells on ribbon is a fantastic idea for presents. 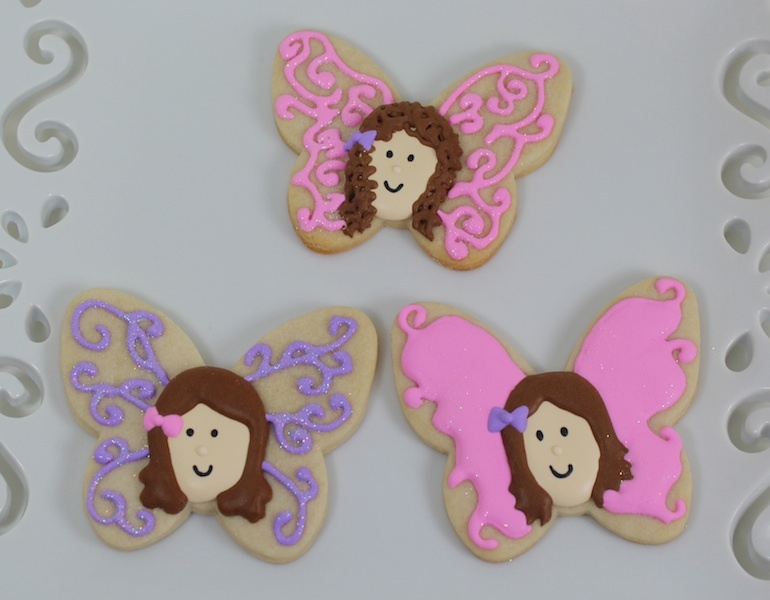 Sweet little fairy cookies! My wrapping is done and I could not be happier.